For 45 years, Birmingham's Vanley Burke has captured the lives of the Caribbean community in and around Handsworth and it's won him international acclaim. 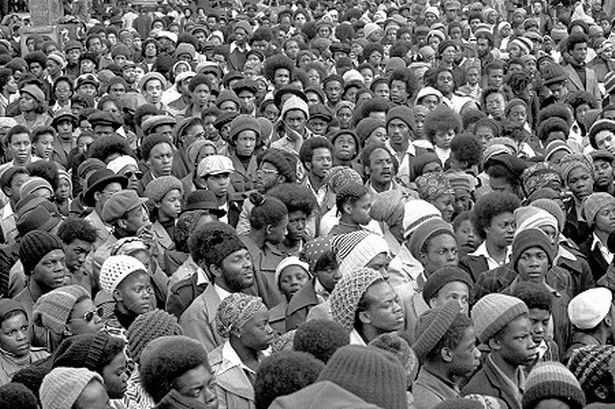 Vanley Burke's pictures of African Liberation Day in Handsworth Park, 1977. For 45 years, Birmingham&apos;s Vanley Burke has captured the lives of the Caribbean community in and around Handsworth and it&apos;s won him international acclaim. Ahead of a retrospective exhibition of his work he spoke to Justine Halifax. Dubbed the “Grandfather of Black British photography”, Vanley Burke was aged just 10 when he held a camera in his hand for the very first time. Only the second camera the Jamaican boy had ever seen, it was an iconic Box Brownie that his beloved mother had sent him from Birmingham, where she was living. “Where we were from, in rural Jamaica, we weren’t used to seeing cameras. Any gift, such as a toy car, would have been welcomed, but this was different,” he said. “I was intrigued by how the image was recorded. I was fascinated by the science of how the images got from one place to another and how you could reproduce it. After it was explained to me I started using it. “The experience of using it was so intriguing, too, as was the smell of the film itself. For in an internationally acclaimed career spanning 45 years, the father-of-three has amassed an impressive visual collection of images that documents the lives of the Caribbean community living in and around Handsworth. Not only has his work been described as “unparalleled”, so too has his ability to connect with his subject. And now Birmingham’s mac is preparing to host a retrospective exhibition of his work, entitled By The Rivers Of Birminam, featuring 100 photographs, shot entirely in black and white, some which have never gone on public display before. Mac spokeswoman Charli Hill said: “Since the mid-1960s, Vanley Burke has photographed the Jamaican community in the Handsworth area of Birmingham. “By the Rivers of Birminam will bring together 100 new and existing images for the first time which explore the history of the Caribbean community in the city from 1967 to the present day. “Curated by Lynda Morris, the exhibition charts Vanley Burke’s practice over the last 45 years, during which time he has produced what is considered to be the greatest photographic document of Caribbean people in post-war Britain, detailing the experience of black people in the UK and their community identity. She added: “Burke has had, and continues to have, an intimacy with his subject that national press photographers historically have been unable to achieve. “This can be seen in the portraits of the generations from childhood and youth to old age; the musicians, the intellectuals, the soldiers, the church choirs and the members of the Nation of Islam. The images will be accompanied by contemporaneous newspapers cuttings, including from the Birmingham Post, which will put into context the wealth of images taken at key historical events. The grandfather-of-five was at African Liberation Day in 1977 in Handsworth Park, where Britain’s biggest ever all-black crowd had ever gathered. He was also there in 1981, 1985 adn 2011 when Birmingham’s streets erupted in violent riots. But why and when did the long standing fascination with the camera and documenting Caribbean life in England begin? It all started when Vanley, who cites James VanDerZee as one of the people who inspired him, moved to Handsworth as a 15-year-old boy in 1965. Initially, he used photography as a means of telling friends back home in Jamaica about what life was like in England. Vanley said: “As young children in Jamaica we would fantasise about what life was like in England. “The only way to reflect on the experiences of people who’d already emigrated was through photographs which had invariably been taken in studios in England, standing next to a vase of flowers or a telephone, for example. “But for me that didn’t show the trees and the houses and their lives outside the studio. “Some people also returned to Jamaica after having accidents while working in England, including one who returned in a wheelchair, this was the first time I’d ever seen a wheelchair. So we started to think; What is this place? What is going on there? But in response to “quite derogatory” and “blatantly racist” images and comments about immigrants in the mainstream media he sought to set the record straight. He added: “I wasn’t far from the start of this group of people establishing themselves in the landscape so I felt I was in a unique position to start documenting their lives. “The photographs are very much a part of a documentation process which we as black people need to go through. It’s not an attempt to show the black community to the wider community. Vanley’s amazing work has been exhibited extensively across the UK and abroad. With solo exhibitions in New York and Mali and closer to home at Birmingham’s Ikon Gallery, Birmingham Museum and Art Gallery, the Black Arts Gallery, London, and Cornerhouse, Manchester. Although much of his work is centred around the Handsworth area, Vanley has also worked in many other towns and cities and overseas, including in South Africa during the struggles against apartheid. Shortly after the release of Nelson Mandela, Vanley took a self-financed trip to South Africa to record people and events in post-Apartheid. Although not included in this exhibition, Vanley’s collection also includes photographs of the visit of Malcolm X to Birmingham and of Enoch Powell’s Rivers of Blood speech, which was delivered to the Conservative Party in Birmingham. But as well as exhibiting his work in prestigious galleries he has also ensured his work is accessible to all by exhibiting in community centres, clubs, pubs, churches, pool halls and schools. His work has also been used on a UB40 record sleeve. Lynda Morris, curator of By The Rivers Of Birminam and senior lecturer at Norwich University College of the Arts, said: “By The Rivers Of Birminam is a recognition of the outstanding achievements made by Vanley Burke during his long standing practice. “His connection with the subject has allowed him to depict the immigration of the Caribbean community to Great Britain in a way which has been, and continues to be, unparalleled by any other photographer working in this country. Vanley, who says the secret of his connection with his subject is to maintain a continual dialogue, was inspired to do the exhibition by his mother, who would also love him to produce a photographic book of his work. Vanley added: “I’m very pleased that I am able to do this exhibition, most definitely.